Each year we look forward with great interest to our annual Penns Creek Weekend Package. This year we are hosting on April 26-27. FFPA considers Penns one of the top trout water in PA...and on this trip you will find out why. Penns really is the complete package - - from the bugs to the scenery to fish.They are the stuff of legends. On top of this you will also have first-class streamside lodging. Does it get any better than this? Email us for any questions and be sure to read more by clicking on the image to the right. We recently had out Adam and Luke for a full-day outing. For mid-to-late-April the conditions were fantastic! With the help of the Francis E. Walter Flow Management Working Group the mid-April fishing opportunities on the Lehigh have been superb so far this year. We've noticed quite a few anglers out and all have commenting on the quality fishing experience they've been having. As for the trip - - both Adam and Luke are small stream guys, so for them, the Lehigh is huge water. It is safe to say that they got a real good dose of what the Lehigh is all about! We are talking big bows in heavy current - - which lead to the hooked/landed ratio to be skewed in favor of the fish. As is normally the case for early-season Lehigh fishing, the bugger was the hot fly. We should also mention that we did get one wild brown or multi-year-holdover-fingerling - about 12". As for the bug life - - it was prolific - - hendricksons, quill gordons, little black caddis, black stones and a green bodied caddis. No risers though. Still to cold yet - - with a 52 registered on the thermometer. 60 is usually the cut off for solid dry fly action. With little to no rain in the forecast continue to look for solid fishing. Now is the time to hit the gorge. It should be loaded with fish and keep an eye out for risers - - they should be looking up any day. Luke with a quality bow. Based off of the press release, and link above, you would think the releases from the NYC Upper Delaware River Basin Reservoirs would continue at a steady rate. Well, that is not the case. Just take a look at the graphs below. The left chart shows the Cannonsville - West Branch release; while the chart on the right shows the Pepacton - East Branch release. You can easily see that on about April 17, releases started to be cut back drastically. It is kind of ironic that the day an agreement is struck between the basin states, and the feds to lower the reservoirs, and create some sort of void, we instead are now looking at minimum releases. I guess that is tailwater management for ya. PA could use some rain. If we were in the middle summer there would be no worries with the stream flow levels since they would be considered on the high side. But with us stepping into the meat of springtime, and prime tree-budding season upon us, the streams are only going to continue to get sucked up at a good clip. Lets hope we get some timely rains and not have a repeat of last May 2007. Down here in SE PA the apple green caddis is emerging here and there on our local waters. An effective pattern we have found to imitate this hatch is a simple CDC tie. We like to use brite green synthetic dubbing, and brown CDC for the wing. Simple, but effective. That is our motto when it comes to patterns. If you've never used CDC - - you should give it a shot. It is expensive if you do tie, but can work very well in certain situations. Think of it as another weapon in your arsenal. For instance low humidity and CDC go well together. The recent dry, high sun days we've been having as of late is perfect CDC weather. The CDC will air-dry with just a few false casts. This means less downtime drying flies when you are slaying trout. Finally, we un-tarped the Clack from its winter cacoon and splashed the Lehigh for the first time this season. Conditions were great for the first half of the float - - sunny and not too much wind - -that changed though at 2pm - - when the clouds, rain and wind moved in with vengence. At that point, the fishing shut off and we did not move a thing. When the fishing was good the hot fly by far was a brown woolly bugger fished off the bow (inside joke ;^) - down deep. This ain't your normal trouty-bugger either. We are talking a #4 salmon hook, with a cone and lead wraps. Add to that a sinking line, some lead shot and a hard mend. You get the picture. Deep and slow...but on the swing up, and off the bottom the trout were slamming our patterns. Until at least the sun went away. Water temp was just 48F, and never budged. The Corps held the release from Walter at about 460cfs - - which put ~1100cfs of flow in the stretch we worked. Bug life was plentiful and quite prolific despite the air and water temps. Even long after the sun was no longer showing the bugs were hatching. We saw - Hendricksons (14); small black caddis (20); olives (18); blue quills (18); and a few little black stones (14). We did notice a couple of risers along the way, but nothing consistant. Look for flows well downstream, and releases from the dam to be in the fisherman-friendly range again this weekend. Barring any significant rain, the Corps should be releasing 400cfs, give or take a few cfs. See ya out there. Yeup! It is the time of year for the masses to hit their local water, or even better yet, their favotire hole. For the majority of PA - this coming weekend is Opening Day of trout season. Big deal for some - big whoop for FFPA. We've already been on the water, and pending any rainfall, we hope to make a Lehigh run. Flows should be below normal for this time of year, due to the fact that the Corps plans to drop outflow at Francis E Walter to 400cfs in order to make this big water more angler friendly. This policy is written into the Corps 2008 Flow Plan. The 19-20th weekend will be 400cfs as well. With the help of the Corps, the normally unwadeable at this time of year, Lehigh, should be fishable for the wade angler. Studs and a wade staff are a must and dress warm. The water is still COLD! Check it out as an alternative to your normal opening day routine. There is a ton of water, and quite a few locations can fish well when the water is up. If we do get out, lots of lead and big buggers, deep and slow will be our rig at the start. Risers....doubtful, but the bugs should be starting. Some mid-day warmth will only help this cause. Can you say April Grays? See ya on the water. We still have space available for our annual Penns Creek Overnight. The dates are April 26-27. Email us for inquiries - info@flyfishpa.net. Also, we have limited dates still available for the Lehigh. For the fly angler/golfers out there...instead of booking that foursome at that tired 'ole track, sign up for one of our two-boat Lehigh driftboat trips. Stream-side lunch included along with drinks. We promise you, there won't any slow play. Email us for dates. 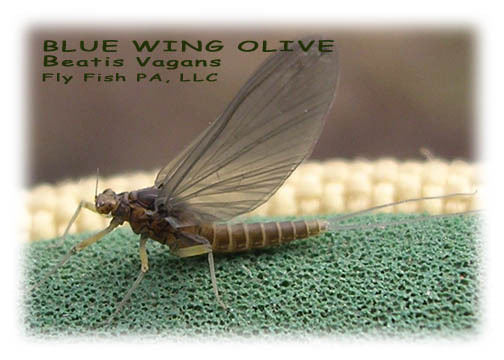 We've got blue quills and olives hatching during the heat of the day down here is SE PA. Unlike later in the season when overcast days are usually the best, this time of year sunny or overcast, will produce good fishing. Generally what is usually needed to stimulate the bugs, and get the fish going is just a couple of degree rise in water temp. This time of year we like to time our time-on-the-water to coincide with this jump in temp - - and if you are able to do this as well - - you should be rewarded. Look for the post-lunchtime hours to have the best hatching/fishing. Be sure to check out our Penns Creek Package. There is still open slots for this late-April, early-season, two-day package. For any questions feel free to email us at info@flyfishpa.net. We hope you will join us. Penns never dissapoints.